Our sages say that the month of Cheshvan is called Marcheshvan [bitter] because it has no holidays. But, I think it is more than that. This month has seen its share of bitter experiences. Rachel Imeinu's yahrtzeit is 11 Marcheshvan. The Great Flood of Noah's time began on 17 Marcheshvan. Rabbi Meir Kahane was murdered also on 18 Marcheshvan just like these Jews in Pittsburgh. The 18th - chai - life! And the name of the synagogue - "Tree of Life." Death in a time and place linked with life. What does it mean? The Diaspora can no longer sustain Jewish life. Through massive assimilation, it has become another Jewish mass grave. In all our minds, the number eleven will forever be linked with the tragedy of the 9/11 terror attack on America. 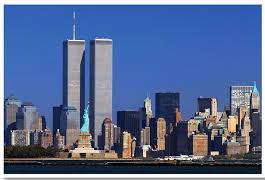 I believe it was Rabbi Winston who first pointed out that the World Trade Center Towers, also known simply as the Twins, themselves made an "11." The most famous "twins" in Judaism are Eisav and Ya'aqov. HKB"H gave Ya'aqov a new name - Yisrael - when he successfully overcame the struggle with Eisav's ministering angel, the Satan himself. When our forefather acts like Eisav's twin, he is called Ya'aqov, when he rises up to the level of Yisrael, he is no longer Eisav's "twin." The Twin Towers are but dust now and in their place a single proud and powerful tower stands - the Freedom Tower. No longer two, but ONE. "One New Man" who in the name of "Freedom" has cast off the Yoke of Heaven. Just like Ya'aqov did not earn the name Yisrael until he crossed back over into Eretz Yisrael, so the Jews of the Diaspora, particularly the West, will remain Ya'aqov, the twin of Eisav, until they return within the borders of the Holy Land where Yisrael resides. And like the Freedom Tower that has replaced the Twins, so the Jews of the Diaspora will become so assimilated as to be indistinguishable as a separate entity. Events like what just happened in Pittsburgh come for one reason only - to remind the Jew that he must rise above the level of Ya'aqov, separate himself from Eisav, and become worthy of the name Yisrael by returning to the Land of Yisrael. Did we think that Jews could really abandon the Torah and mesorah and become Americans withiut a counter reaction from the Borei Olam? Are we really that stupid, that naive, to think the Borei Olam would let the Jews totally assimilate? Now we see the answer. And it is NO. The Borei Olam will NOT allow us to totally assimilate into America. Jews in America had a period of Hesed to mend our ways. To make tshuvah and strengthen in observance. We were sent Torah Giants to mehazik us in Torah. DID WE RETURN WITH A WHOLE HEART? Sadly, we did not. We stregthened in pursuing every bizarre ideology. We strengthened in careers. We strengthened politics. We stregthened in academia. We stregthened EVERYWHERE but Torah and avodat Hashem. Rabbotai, now the bill is due. HaShems chesed does not last forever. There have been steady attacks recently in NY and Chicago. Now we have this. When the American petro dollar falls it will get worse. HaShem has many agents to send R'L. Stregthen in Torah and make an escape plan to Israel. I hope Israel has a backup plan for mass american aliyah but I doubt it. And yes, it's going to get worse still, r"l.
"'"The Israeli government has decided that not all Jews should immigrate from the United States to Israel, and a bridge must be maintained between us and them. It seems to me that after the latest attack, the Israeli government will have to intervene in the matter of security of American Jewish communities." Translation: the medinah values Jews in in America for their political clout to influence a pro Israel policy. However, the medinah does not value the safety and long term future of Jews in America..
Actually this process has been going on since the Blaustein–Ben-Gurion Agreement. The reformists chose America over living in the land of Israel long ago. The Jews in America and the Diaspora also have to elevate themselves spiritually and rise up to the next level after making Aliyah. Israel is more then just a material place like New York, Los Angeles, London or San Francisco, Israel is a deeply spiritual place that needs to be tapped into to elevate your soul. Thanks. That was very interesting. For what it's worth, I have two sources claiming that the bris that was taking place at the time of the shooting was for twins adopted by a gay couple, r"l.
"Rabbi Tuly Weisz is the editor of The Israel Bible, the first study Bible edited by Jews for Christians and dedicated to highlighting the land and the people of Israel, a #1 New Release in both Jewish and Christian Bible categories on Amazon." It is clear as day that Hashem did it, as a punishment for the evil of reform ! This small crazy Amalekite guy was just a puppet and a tool in the Hand of Hashem. Get it ! Yes, it's a bitter truth, but it is the truth ! And the clowns like "rabbi" Riskin call these reform "jews" to immigrate to Israel - to pollute this place even more than it is polluted now. And the clowns like Bennett and his ilk are dancing around proclaiming their "unity" of Israel. Unity with whom exactly ? With the reform evildoers, who are mostly not even jewish, by the way ? Unity with the proud desecrators of Torah ? Unity with those whom Hashem just has punished by death for their rebellion against Him ? Do you understand what a unity with these folks really mean ? It means to join the club of those whom Hashem targets with deadly punishments ! Do you want to die together with those evildoers, whom Hashem hates ? If no, then do not speak about unity with them, but rather separate yourselves quickly from them, if you'd like to survive the real punishments of the per-Messianic times, which will very soon come upon us ! R'l, learning from reading this post and the comments, it is so obvious the reasons for all the tzarot. H' is showing His Hand, so to speak, openly for all who want to see. Seems only the yirei Shamayim understand. This Weiss mentioned in the comment above should not be called a 'Rabbi'. He is a kofer. "Isaac and Ishmael Can't Coexist"
"Danger Ahead! Beware the Grace of the Nations"
"The Lord Works in Mysterious Ways"
Lech Lecha - "Go for Yourself"
"KIddush Hashem"? Or Chillul Hashem? "Separation Is the Key to Redemption"
Was Eisav the "Fourth Avot"? "In the Beginning...Out of the Chaos"
Another Attack on Jerusalem Imminent!